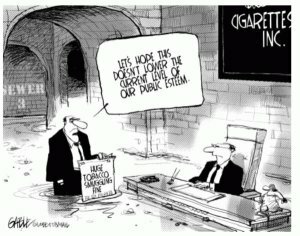 In an article by Anne Sutherland in the March 20, 2008 Montreal Gazette, Florent Gravel, president of the Association des detaillants en alimentation du Quebec, said that because of new regulations restricting the display of tobacco products in retail outlets (similar restrictions go into effect in BC at the end of March), retailers will lose the product-placement fees they receive from the tobacco companies for preferential display of their wares. According to Gravel, this ranges from $3,000 to $7,000 per year depending on the size of the store and the size of the display. You read this correctly: until now, the tobacco industry has been paying bribes to retailers.